Salmon is one of my favourite things to eat. I like it grilled, poached, roasted and even fried. Baking keeps the salmon moist and is my favourite way to prepare it. The Thai chili sauce is sweet with just the right amount of heat. This salmon is easy to prepare and elegant enough for company. Enjoy! 1. In a small bowl, mix the chili sauce, soy sauce, sesame oil, one garlic clove, ginger and pepper. 2. Place salmon in a shallow glass baking dish, and coat with the chili mixture. Cover the dish, and marinate salmon in the refrigerator 30 minutes, turning once. 5. While the salmon is baking add the potatoes to boiling salted water for 5 minutes to partially cook them. Remove potatoes from the water and transfer them to a well oiled hot grill. 6. Grill the potatoes along with the asparagus for 5-7 minutes. 7. Combine the olive oil, lime juice, zest, remaining garlic, salt and pepper. 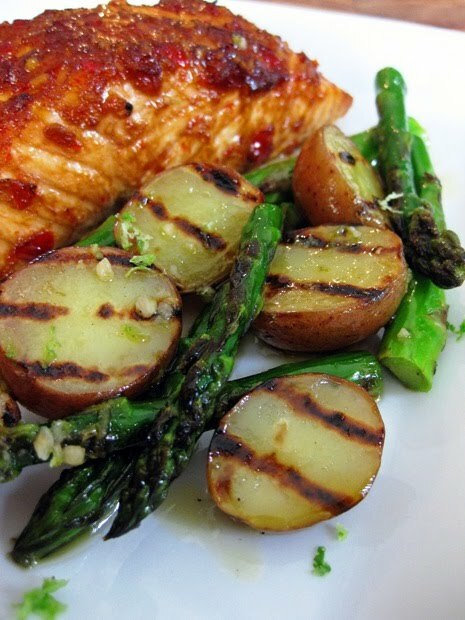 Toss the cooked potatoes and asparagus in the dressing and serve with the salmon. Ooh this is perfect! I have had a friend asking me for tips to cook salmon, and she loves sweet and spicy stuff. This is perfect for her! Thank you! Definitely convinced on that sweet chili sauce. Under the post in the Link Within Gadget I see two more I'd like to try - honey Lemon with roasted vegs and grilled salmon with papaya sauce. 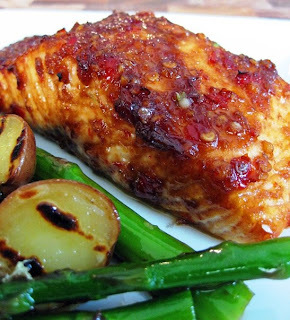 This salmon sounds wonderfully delicious with the sweet chili sauce! Mmm i love salmon and i love anyyy sweet chilli sauce so this sounds amazingly delicious, may have to try it out hehe! That salmon looks freakin' delicious! YUM, We eat Salmon at least two times a week and this is on Next Weeks MENU!!! Is it MONDAY yet? Has anyone tried grilling the salmon too?